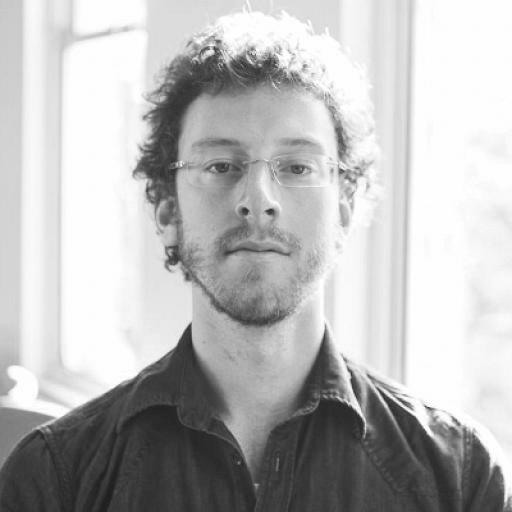 Geoff Lemon is a writer, editor and broadcaster. 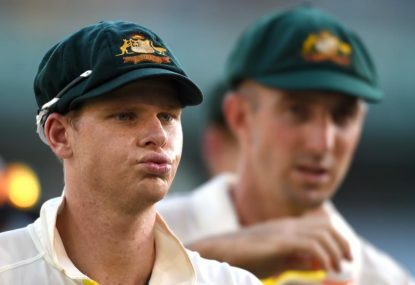 He's the host of cricket podcast The Final Word, and author of the book Steve Smith's Men: Behind Australian Cricket's Fall. If you crack a window open and hear a distant rumbling, it’s nothing to do with Formula 1. 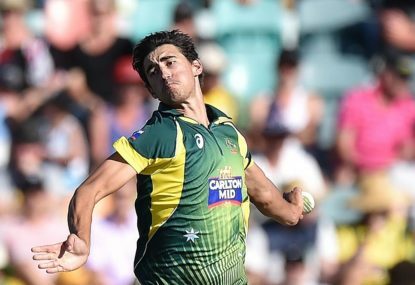 It’s Mitchell Starc heading towards the Melbourne Cricket Ground, and he’s picking up speed. 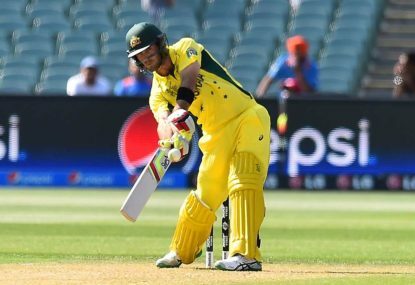 More than any other Australian cricketers in this World Cup, Glenn Maxwell and Mitchell Starc have shown they can ride a wave. Four games into this World Cup campaign, and Michael Clarke has faced 18 balls. 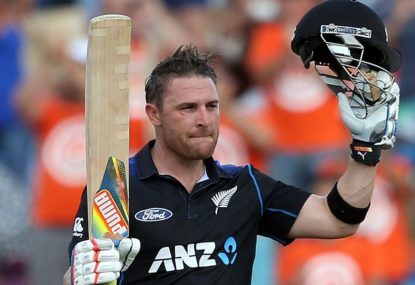 In fact, after sending down five overs against Afghanistan, he’s bowled more than he’s hit. Despite the hype, despite the favouritism, I’m willing to go on the record. 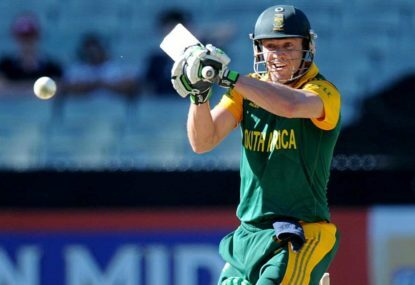 South Africa can’t and won’t win the 2015 Cricket World Cup. It may have been a great finish, but Australia have a lot to think about, even if their Eden Park embarrassment was partly disguised by some bowling magic from Mitchell Starc. 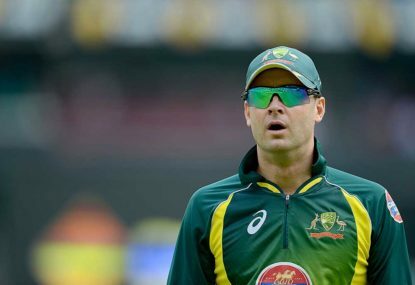 Australia’s World Cup match against Bangladesh was Michael Clarke’s fitness deadline. The date was described as harsh. 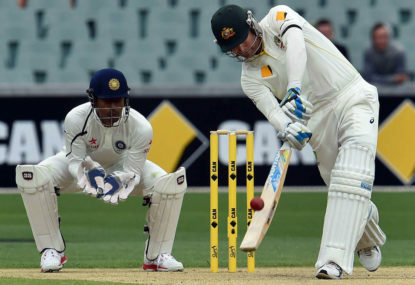 Shane Warne accused selectors of trying to “break” the absent captain. But in the end, Clarke didn’t have to play. If smashing England by 111 runs weren’t good news enough, Australia’s opening game of this home World Cup offered some more specific cheer. In Australian cricket we like to tell ourselves that team selection is a process untainted by sentiment. 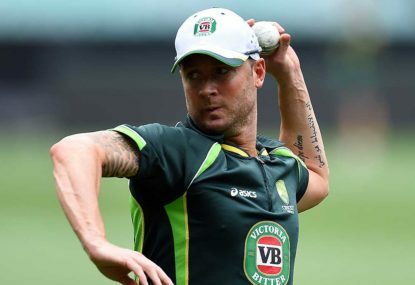 Michael Clarke’s selection for the World Cup – as captain, no less – could not be more contrary. 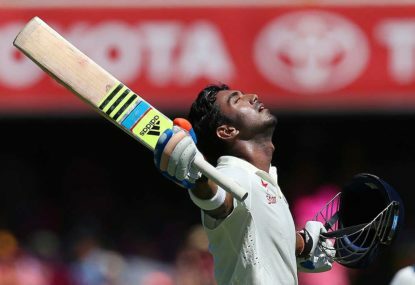 “So we beat on, boats against the current, borne back ceaselessly into the past.” It might not be an obvious link, but for a time KL Rahul kept putting me in mind of F. Scott Fitzgerald. 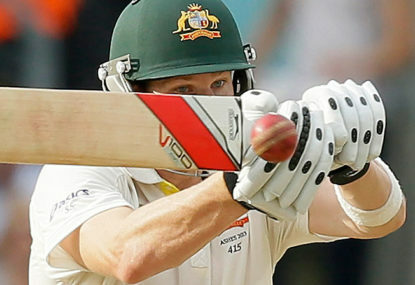 Smith could better Bradman, but can he catch him? If Steve Smith gets another 18 runs in the fourth Test against India, an old and mighty record will fall like an ancient oak. As his innings commenced in Sydney, you swore you could hear Shane Watson thinking. Not to imply that his mental machinery is so lumbering as to be audible from the stands, but his desperation to succeed was conveyed in broadcast quality. 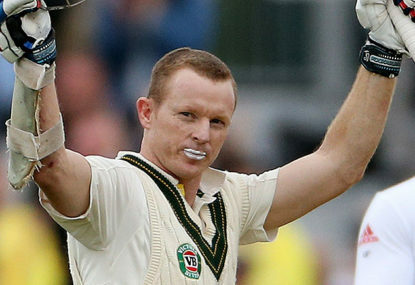 Before this Australia-India series even began, some people were very down on Chris Rogers. Too old, too slow, too close to the end. If cricket can be characterised by the ponderous tick of a scoreboard clock, Mitchell Johnson is a player in fast forward. As debutant Josh Hazlewood completed his five-wicket haul on Thursday, the last piece of Australia’s bowling future may have clicked into place. 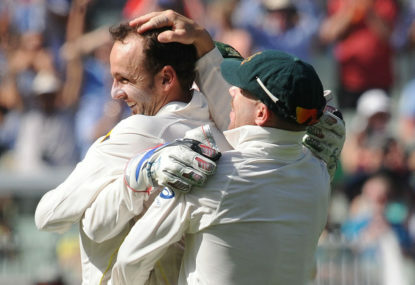 On the final day of the Australia-India classic, there was an over when Nathan Lyon’s career might have ended. Had Michael Clarke elected to keep batting on the third morning of this first Test against India on Thursday, Steve Smith could have had a Test double century within the hour. 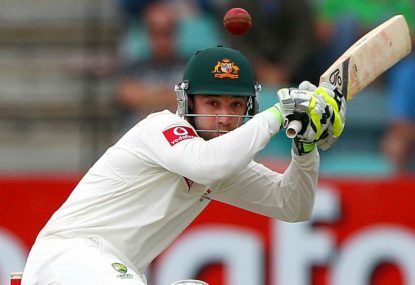 At the end of play on Tuesday, Michael Clarke’s career was over. By Wednesday he was cricket’s dominant human. You wish people could make up their minds. 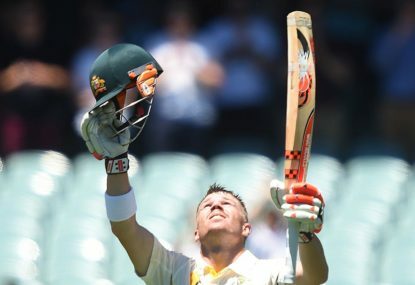 David Warner shouldn’t have been able to play that innings. The clean intensity of his attack, its consistent tempering with restraint. His progress from a former youthful fury to a current clinical precision. For a grim fortnight cricket has been on everybody’s minds, but no one has been thinking much about the cricket. There’s a relief to having a game about to start. This is not the script. It’s all I can keep saying, impotent against the weight of fact bearing the other way. Employers do tend to distance themselves from a hitman if things go poorly. That old chestnut. Two of the last five have been Tasmanian. For me, the domestic 50-over comp just doesn’t has much relevance. For anything. It’s run and won in 10 days, and guys can have a flyer or a dud accordingly. Players who’ve done well there haven’t necessarily done well when picked for Australia months later – take Lynn or Short. 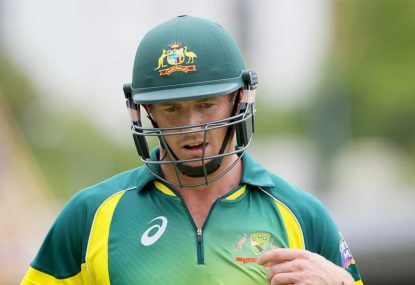 As for coming in late and down the order, Wade has played some gems for Australia in ODIs doing exactly that. His BBL work is replicating what he’s done in the other format. G’day Bushy. I meant Liebke, not me. My only takeaway from this is that you’re annoyed at a satirist for making fun of things. The schedule wasn’t to do with India not wanting to play at the Gabba, it was to do with India not wanting to play a day-nighter, and CA wanting to schedule India at Adelaide regardless as a marquee game. Brisbane was the only day-night option so had to be reserved for Sri Lanka, and Brisbane draws poor crowds whatever the schedule. G’day Troy. My take: Head was second-highest scorer in a very low-scoring series. It flattered him. 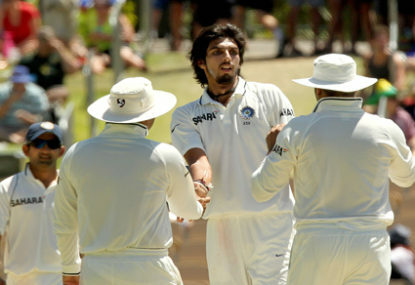 And at least half his dismissals were to horrible loose shots – caught twice in a Test at third man? That sort of approach won’t fly in England, and he can’t be retained if he doesn’t show he’s learned from it. I like him as a player, but he’s a long long way from having nailed down a spot. Yep, people are unusually united on the question by now. It’s only fair to give him a shot. Thanks Spruce – it was a pretty hectic schedule touring South Africa and then getting the book done, so I’m glad you enjoyed it. They can, in theory, and they almost never do. Which indicates that the short-pitched bowling referred to in the original post is legitimate. I think there’s a huge amount of that: justifying their own eras and legacies. Because the honesty about Australian cricket’s flaws exposes the flaws in their eras and leadership. There are plenty of Williamson-type examples through the game’s history, at all levels. The myth about aggro being necessary is just about people justifying their self-indulgence. Yeah, the fetishisation of it came with Waugh. My guess is that Whateley was referring to a period where Clarke tried to regenerate it, to fake it, after it had died away for a while. And Clarke was certainly the one who started winding up Warner and defending him whenever he went wrong. Thanks Mitcher. If we needed one simple definition, I’d say talking about someone’s cricket is alright. Talking about anything else probably isn’t. And if you’d be embarrassed to have your comment picked up on a stump mic, you shouldn’t be saying it. Agree with that point. A team full of great players doing what they do is a fair bit more demoralising than if they mouth off in the process. That only serves to put an asterisk next to their achievements. “Stood up to a player who was bullying his teammate” is a good gag. 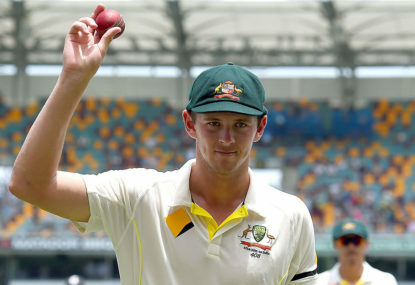 Anderson was bullying Bailey while batting at No.11, on his own surrounded by 11 opponents, with one wicket to fall to lose the Test, facing Mitchell Johnson in the dark. Mmm-kay. I agree with your other points, though. Thanks James. It seems like a lot of the people involved are deliberately vague about the nature of what gets said and what’s ok.
Short-pitched bowling is part of the game. Batting is balancing the need to protect your wicket, add to your score, and preserve your safety. It’s not about the danger of the action. It’s that the cricket part of cricket is kind of necessary. Mouthing off isn’t. There have been 19 successful chases of more than 322 runs in Test history, across 2300 Test matches. Saying that Australia didn’t succeed because they weren’t ‘tough’ enough is … just silly, really. Hazlewood may open the bowling, but I’d still argue his role is closer to Siddle’s. Play the straight man, give nothing away, support the two more attacking bowlers. He fulfils that role with a bit more venom than Siddle did, but it’s still basically the same job. Cummins comes on to push for wickets and bowl express. 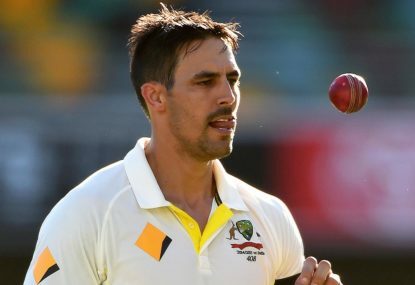 Ashes to Ashes: Would Mitchell Johnson's Ashes team beat Mitchell Starc's? Merry Christmas to you too, James. Hope it was a corker and you’re watching some cricket. Agreed, Rogers played a number of important innings in that series. And suited Warner well as a partner. I wrote the full transcript of her extended interview on ABC, and she said nothing of the sort. Had three chances to say exactly that, and declined three times. The interview is probably on the Grandstand Soundcloud page if you want to listen. It doesn’t get a crowd because it’s a shocking place to watch cricket. It’s deathly hot, uncomfortable, there are no toilets, you can’t take food in, and what they sell there is extortionate. People would rather watch on TV. Given them a comfortable new stadium where they feel at home, and crowds will grow. The first ODI there is sold out already.